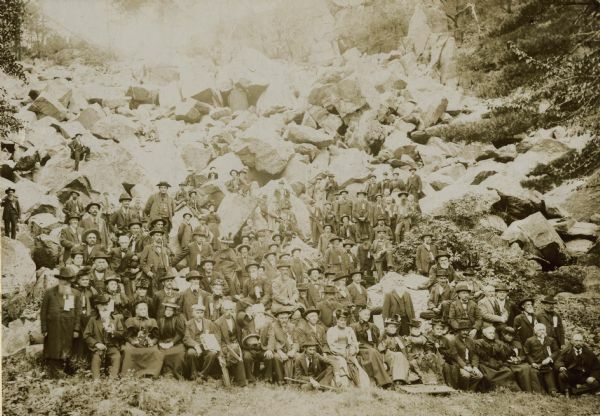 Outdoor group portrait of a reunion of the Iron Brigade, veterans of the Civil War, and their families at Devil's Lake, Wisconsin. The couple seated in the first row, second and third from the right, are Colonel and Mrs. Cornelius Wheeler of Portage, Wisconsin. Colonel Wheeler (1840-1915) served in Company I of the 2nd Wisconsin Volunteer Infantry from 1861-1864, and was later Governor of the Northwest Branch of the National Soldiers' Home in Milwaukee from 1892 to 1915.